Marble table: West Elm (sold out but similar available here). Marble effect tray: H&M (old). Hydrating eye cream: £32, Bobbi Brown. Peony and peppermint candle: £24, Evermore. Deep Sleep Pillow Spray: £16, This Works. Beauty Elixir: £11.50, Caudalie. Arctic face oil, £30, Skyn Iceland at Marks & Spencer. Charcoal face masks, £9.99 for 3, Masque Bar. Stressed skin? What with 2 long haul fights this month, being out in the elements with London Fashion Week and working too many days on the trot, it really has an effect. And it’s only in recent years that I have made any attempt to do something about it. As someone that has always suffered from acne and combination skin, I need to spend that little bit extra time on my regime and these are a few affordable items which I have been using lately. I have gotten the face mask bug! It started with the Muji ones and now I’m trying a few different ones. 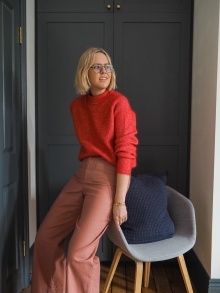 I feel like a bit of an idiot sitting at home (and often scare my husband when I appear from a room wearing one) but I even believe the force of sitting still wearing one, not distracted by phone or a computer, is a good thing. 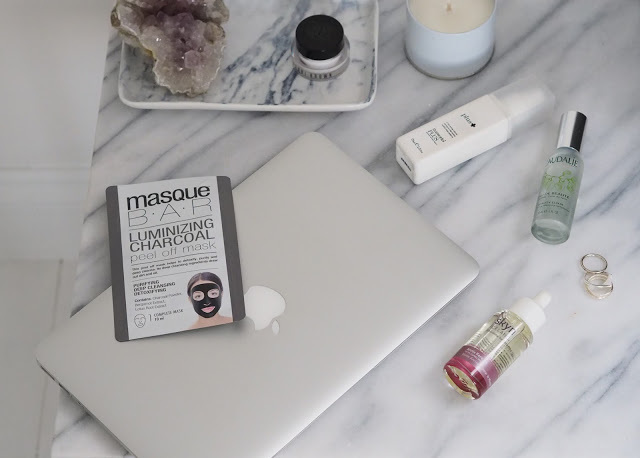 When and Muji masks are sheets and you leave the residue on afterwards to be absorbed, and Masque Bar ones are more of a gel you apply and peel off – the charcoal helps detoxify the skin. 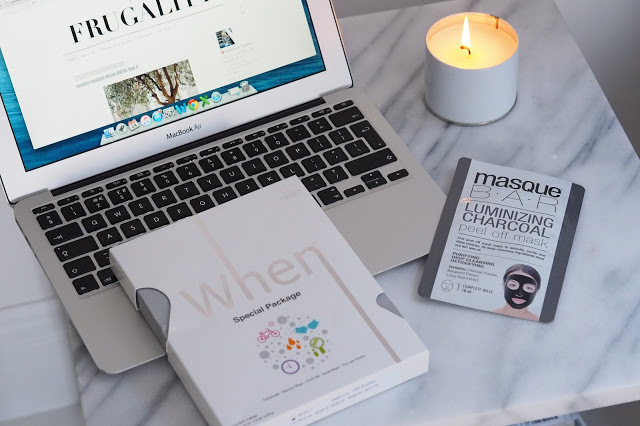 The When masks come in a pack for different situations: travel, tiredness, glamour etc and they also suggest a drop or two of your favourite face oil after the mask for maximum effect and to really help your skin drink in the moisture. Face masks, £25 for pack of 5, When. Charcoal face masks, £9.99 for 3, Masque Bar. I put face oil on every evening now, especially after a day out in the elements – it helps seal in the moisture in my skin overnight. Skyn Iceland is a brand I just really identify with – and its packaging basically describes me – overworked? overtired? It is based on finding solutions for stressed skin. I also use Bobbi Brown’s hydrating eye cream, I probably should have started earlier on the whole eye cream thing but better late than never! I’ve been drinking much more matcha teas lately, really trying to hydrate my skin that way. Companies I love are Bluebird Tea Co for their matcha green tea, Joe’s Tea camomile and Clippers pear and honey green tea. Dozy girl teabags, £4.95, Bluebird Tea Co. Mug: O.W London. It’s so important to relax and unwind after a busy day, and I always spend it with candles on – they’re almost the only thing that I associate with downtime. A friend has set up a beautiful company called Evermore and they have created wonderful hand poured soy candles with scents such as Peony and Peppermint and Pine and Cedarwood, they’re not super expensive at £24 and make lovely gifts. It’s this time of year I tend to crack open the ultra hydrating moisturisers. My skin drinks up this Bliss ‘Drench ‘n’ Quench’ and I use the Origins overnight mask (because someone with no spare time loves beautifying in my sleep! ), waking up feeling refreshed – especially after a few drinks at a party! 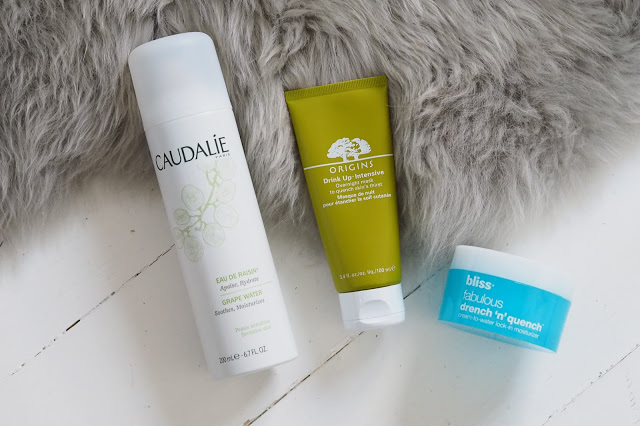 The Caudalie Grape Water is perfect for hydrating during the day, I would keep this on my desk while I work (or sometimes, by my bed to help wake me up in the morning!). Eau de raisin grape water: £15 for 2 bottles, Caudalie. ‘Drink Up’ intensive moisturing overnight mask: £20.70, Origins. Drench n quench moisturiser: £29.50, Bliss. One last thing I have done is really change my travel habits. 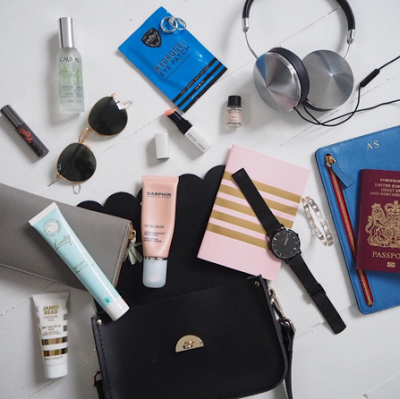 I now take as many beauty products as I can on the flight, especially long-haul – as it’s pretty much redundant time to spend on yourself. Eyeko have these amazing under eye masks which leave your skin all tingly and feeling refreshed (and subtle enough not to make you look like a weirdo on the plane) – perfect for that post nap pre embarkation period. I now always pack moisturiser and Caudalie Beauty Elixir (which they sell in mini, plane friendly sizes) to keep my skin hydrated.